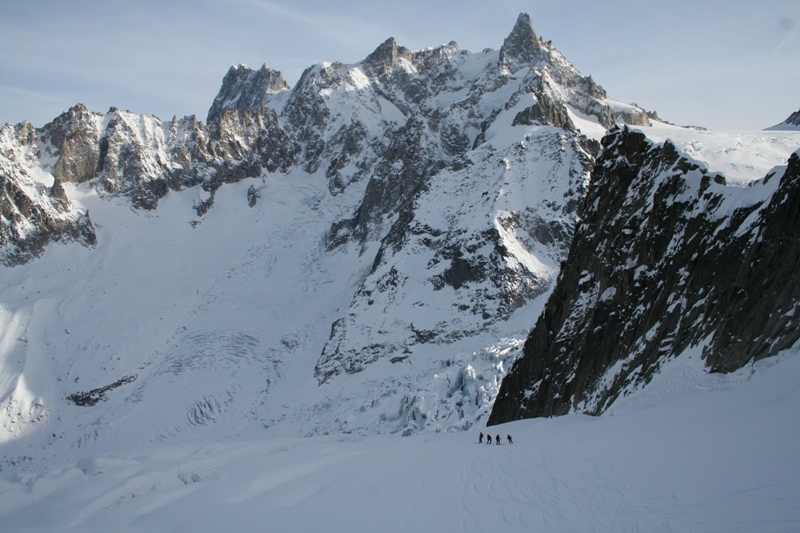 We decided to finish off our stay in Chamonix with the classic Vallée Blanche. 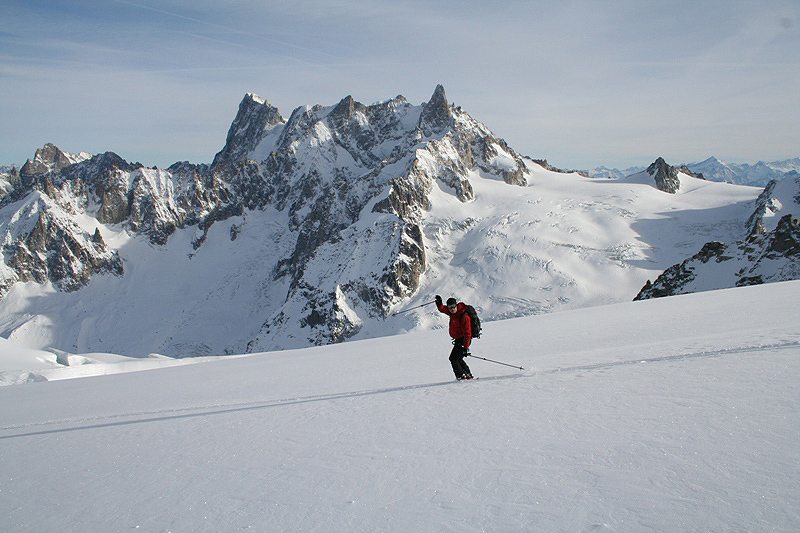 Michael, Christian and I went up early and bought day passes at the Aiguille du Midi, then rode to the mid-station twice and skied a couple of "warm-up" runs. It was pretty tracked up, with a few nice heavy powder turns thrown in, and some classic bushwhacking to get our pulses up at the finish. You finish a few blocks from the base of the tram, and walk back over. A little after noon, Kam and Corinne met us at the base of the gondola and we rode up to the top together. If you haven't ever been up the Aiguille du Midi, the tram ride in itself is quite impressive. You can't help but admire whoever thought of building a lift up here in the first place, much less the thirty-some people who died while building it. The top of the ride is nearly vertical, and you get a feeling of vertigo as the car bumps to a stop inside the rock tower. As usual, we donned harnesses for the ski down "just in case," then had a bit of baguette and pâte lunch on the observation deck. The weather was beautiful and warm enough to hang out comfortably in puffy coats and no gloves. Christian got us organized and tied into the rope for the trip down the knife-edge ridge that leads to the ski. Not many people had done the route this year, so the trail was not well defined yet, but pickets (big steel ones, not the kind you carry in your pack) were in place to use for protection. With crampons on, we felt pretty secure, and Christian followed along in back ready to jump off the opposite side of the ridge should one of us fall. 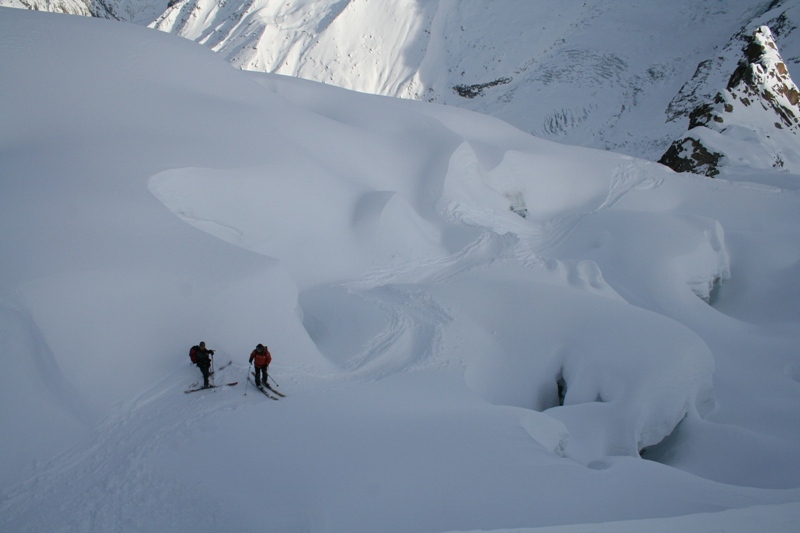 This downclimb of the ridge was the most dangerous part of the trip - once on the gentle face about 150 meters away, we put on skis and began the descent. 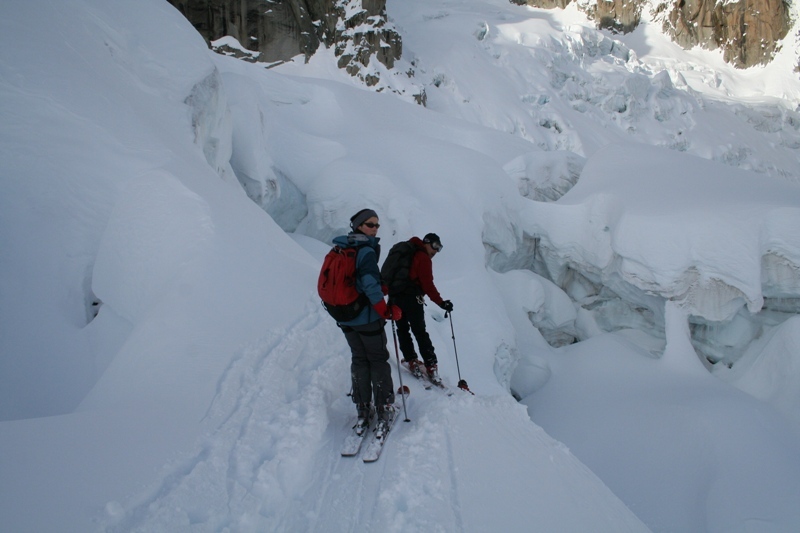 Christian once again reminded us to stay exactly in his tracks as he led us through several spectacular ice falls on the way down - again, not really serious skiing, but you needed to stay in control and not fall into any of the huge crevasses. Once in a while we found some easy wide open patches for some powder turns, but for the most part the ski was a follow-the-leader exercise through some really scenic terrain. We skied around the back of the hut we had seen a few days before looking for better turns, but the slope had been scoured by the wind for a few days and the skiing was marginal. Near the bottom, we rejoined the standard Mer de Glace finish for a bit, but instead of skiing all the way out took a short tram up to a classic stone hotel (Michael and Corinne had almost picked this as a location for their wedding). We did one final "off piste" bushwhack down to town, and called it a day.